Norway's Petter Solberg set the fastest time in Q4 at the World RX of Norway in warm, dry conditions, but it's the other home crowd favourite Andreas Bakkerud who is TQ (top qualifier) in the Intermediate Classification after he saved a huge moment in the second corner in his race and was second fastest. Solberg won race four to set a time that wouldn't be beaten, becoming the fourth different winner of the qualifying sessions at the Hell circuit, and ended third behind Bakkerud and Mattias Ekstrom. The reigning Champion finished second to Bakkerud in race five of Q4 to be second in the sixth Intermediate Classification of the year. Q3 winner Johan Kristoffersson was involved in the contact that caused Bakkerud's moment and also had rear puncture, the Mettet RX winner finishing fourth after Q4 and will join Ekstrom on the front row of semi-final two, Bakkerud and Solberg starting together on the front row of semi-final one. Team Peugeot-Hansen drivers Sebastien Loeb and Kevin Hansen will start alongside each other on the second row of the first semi-final grid in Hansen's first top-12 appearance since Hockenheim. In a pair of Ford Fiestas, Russia's Timur Timerzyanov finished second to Solberg in race five of Q4 and Germany's Timo Scheider won race two to start on the third row of the semi-final one grid. 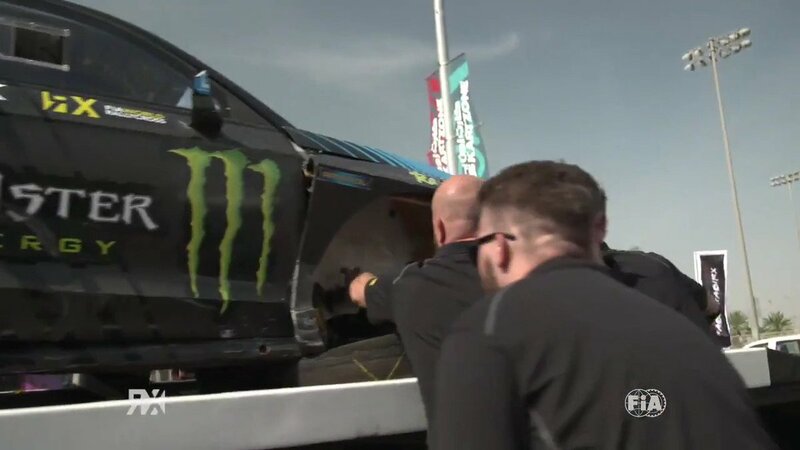 America's Ken Block and Latvia's Reinis Nitiss continued their strong weekends at Hell in Q4 with fifth and eighth time and will start on the second row of semi-final two this afternoon. Finland's Topi Heikkinen makes it three EKS cars in semi-final two, starting on row three with Sweden's Timmy Hansen, who recovered from retiring from Q3 to win race one of Q4 and qualify for the semi-finals in 12th. Find the full Hell RX results here.